It can be difficult to make video game dialog seem natural. 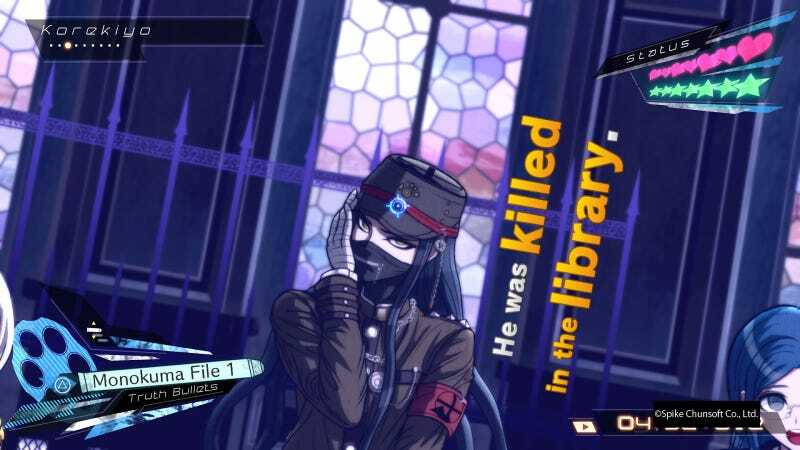 Danganronpa V3: Killing Harmony’s trial scenes use various mini-games to turn dialog into an stressful battle of wits that captures the feeling of real life debate. In Danganronpa V3: Killing Harmony, like in previous Danganronpa games, 16 students are tasked with playing a “killing game” where they must murder one another in order to escape. After each killing, they gather in a courtroom to deduce who the culprit is. In these sequences, the game mixes standard dialog formats for something more active. Much of the trial is taken up by “Nonstop Debates,” sequences where characters speak without pause and the player must select information that counters—or agrees with—their arguments. 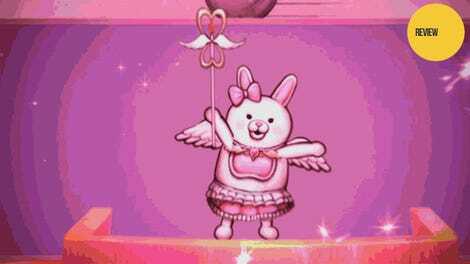 Danganronpa complicates dialog by asking the player to perform mini-games while the clock is ticking. For instance, the way to result a Nonstop Debate is to aim at a specific phrase using a reticule and “fire” evidence to dismiss false claims (or agree with true ones). It requires active listening, sorting through evidence in real time, and reflex skills to simulate a snappy back and forth exchange. I’m slowly making my way through the game and am solving my second murder so I’ll use examples from the first trial. Kokichi: Why don’t you just admit it already? You’re the culprit aren’t you, Miu? Miu: N..n..no way! That’s impossible! K1-B0: So you knew nothing about the trap in the library? Miu: I’m tellin’ ya, I had no idea! Not like, it matters cuz I never went to the library okay? Ryoma: The person who made the cameras would have known their blind spot, too. Miu: Yeah, well… I didn’t make the cameras either! The player’s goal is to support Miu and find ways to agree with her account. What’s telling in the dialog exchange is how peer pressure gets Miu to tell a lie. She did make the cameras but didn’t go to the library. Players can prove the latter by mentioning how another student was in the dining hall with her, giving her an alibi. The pace of the back and forth conversation combines with Miu’s shifting reliability to create a scenario where speaking up feels difficult. We’ve all had moments when arguments carried on without us and all we wanted to do was jump in and help someone. Miu’s dwindling confidence elicits empathy while the continuing debate encourages players to make fast decisions. It’s painful to watch someone twist into a knot because of peer pressure. While conversations in Danganronpa eventually loop, missing a key moment and failing to speak up for someone feels like a genuine failure. In the moments that Danganronpa wants to ratchet up the tension further, it switches to a “Mass Panic Debate” where multiple characters speak at once. The player needs to track three testimonies simultaneously and find the weak link among the arguments. In layering debates together into a mess, Danganronpa doesn’t merely escalate challenge but successfully captures the tone and pace of a frenzied argument. Breaking up a Mass Panic Debate means rifling through potential replies and sifting through an overwhelming verbal assault. In the most frustrating moments of an argument, it’s tempting to take a deep breath and bellow loudly enough to make everyone shut up and slow down. Presenting the proper evidence in a Mass Panic Debate captures that feeling; it’s a bold and decisive display that shuts down a conversation that leapt off the rails. Like stomping your foot down to end your family’s Thanksgiving table politics debates. Trial scenes in games often take a slower pace to stress the act of deliberation and placing clues together. Phoenix Wright courtroom sequences emphasize careful examination of witness statements and accounts from the accused, asking players to track the differences over multiple rounds of testimony. Knights of the Old Republic features a trial on the water world of Manaan centered on the ethical quandary of representing a client who is guilty. These scenarios are interesting brain teasers but never quite capture the pace and feel of a real life conversation the way Danganronpa does. One of Danganronpa’s strongest tools for simulating the feeling of a group argument comes in the form of a “Debate Scrum.” In cases where the group is split down the middle on a decision, they face off against each other to see which argument holds more sway. In gameplay, this means determining which topic is being discussed from context clues and matching that with a decision. The result is a schoolyard shouting match as character dialog pings back and forth before culminating in a button-mashing challenge that feels as familiar as any teeth-gritting moment from real life. Danganronpa keeps trials varied by changing your relationship with words and dialog. When other characters try to shoot down your ideas, the corresponding mini-game involves slicing away their words with a sword in order to fight back against their accusations and locate weak arguments. In order to determine case solving clues, players must spell out the key item or location in a mini-game where jumbled letters float around the screen. When it comes time to shut down the accused, the proceedings shift to a rhythm game. By turning words into daggers and truth into bullets, Danganronpa reimagines how players can experience conversation by focusing on activities that capture the emotions behind debate. Each new activity is an experiment in empathy, frustration, and decisiveness. Just like real world arguments keep us on our toes and scrambling to respond, Danganronpa’s challenges demand we adapt to the conversation.